I was in my six car garage staring at my coolest possession, my car. 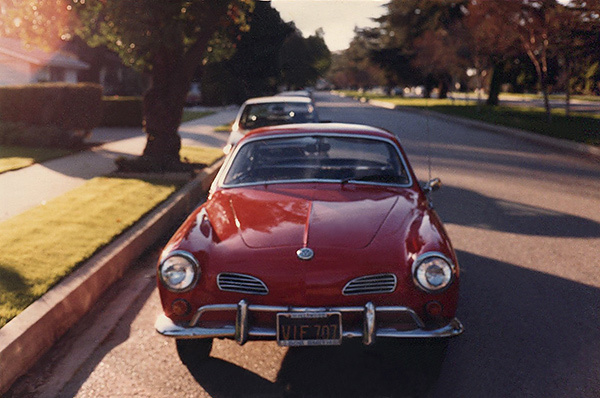 She was a semi-vintage 1967 head turning Volkswagen Karmann Ghia Coupe143. Her exterior was stock bright Iberian red, Manufacturer Code L-31f. Except for the massive chrome power plant I installed myself, she was completely original. 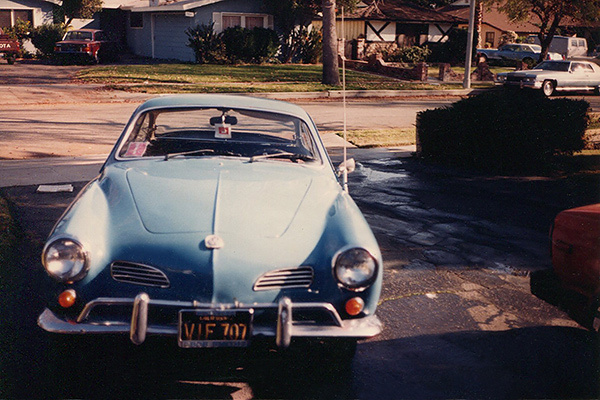 If you don’t know what a Karmann Ghia is, I’ll explain… By the way, this is the story of my Karmann Ghia and me so if you don’t like K.G.’s, I suggest putting the book down. You see, in the opinion of any sane car buff, Ghias are the hottest vehicle Volkswagen ever produced. They aren’t like the V.W. sporty cars of today like the Sorocco or the dumb Dasher. Karmann Ghias are really super bitchin’ even if the upholstery is not from Tony Nancy’s Bitchin’ Stichin’ a mile north on Woodman Avenue in Sherman Oaks. They look almost exactly like the old Porsche 356 series roadsters of the 50’s and 60’s (by the way my dad has one in the garage). You see, the Ghia was a joint effort of a few different automotive companies. 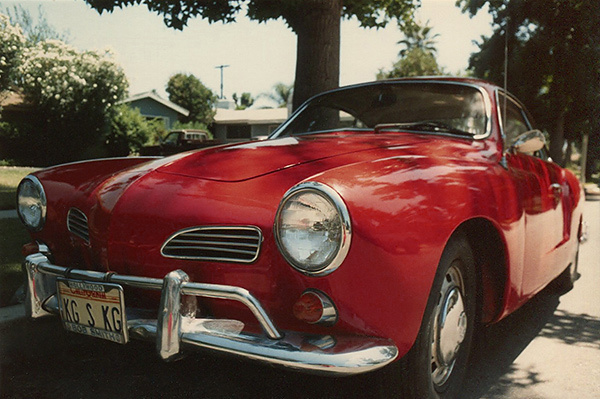 Volkswagen, the famous coach builders of Europe, Karmann, and Ghia all combined to build my dream car. 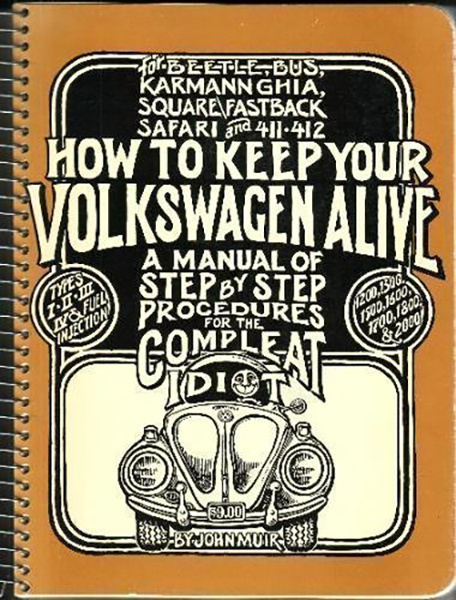 Volkswagen provided the running gear and engine parts. 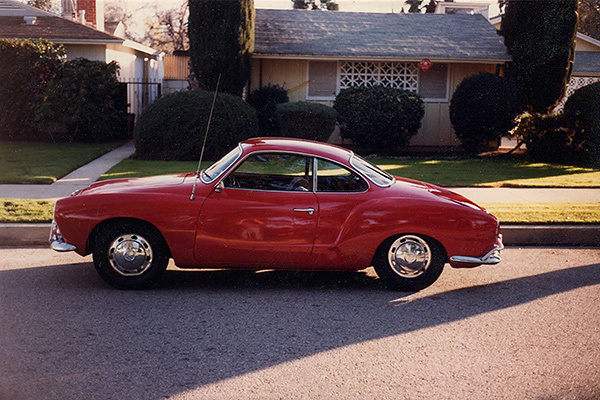 The design and craftsmanship were Karmann. The award winning interior of the two seat Karmann Ghia was made by the famous Italian designer, Ghia. Of course the Ghia engine wasn’t exactly Porsche quality, but the one I dropped in sure was. In fact, my chromed out mighty twenty two eighty was a lot faster! 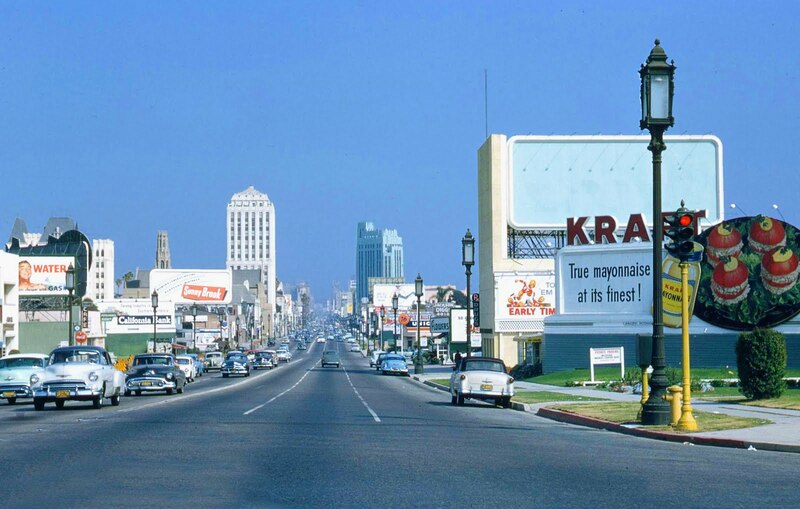 At any rate, I’m obsessed with Karmann Ghias and so are the girls I go out with. 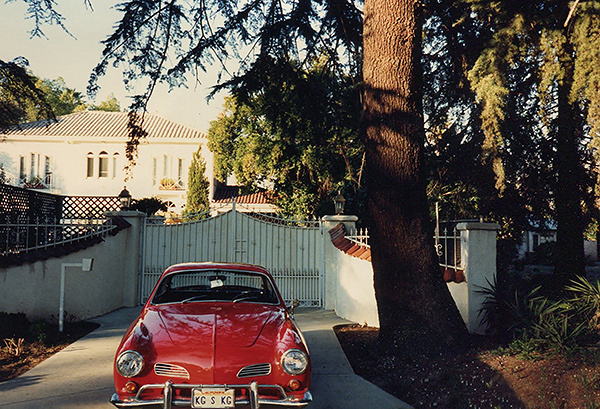 Vintage Karmann Ghias have just gotta be the hottest cars on the street. I own two. You know, I spend most of my time in my Ghias. I drive one and sleep in another. As I mentioned, I was standing in my six car garage so there were naturally a few other rides besides mine in the garage. Yeah, my dad’s company leased black vintage ’65 Mercedes limousine was parked to the left of the Ghia. A silver chauffeur driven Rolls-Royce was parked to the right, but who cares. And by the way, next to the Rolls there was my dad’s vintage Porsche Speedster. When I opened the small door of my vintage Ghia, I was careful not to scratch the paint on the classic condition Mercedes limousine. Last time my dad thought there was a scratch on it he pulled electrical parts out of my car as revenge. So I got into my Ghia, revved its giant engine, flipped on an English Beat tape, pressed the button to my electronic garage door opener from memory with my left hand, shifted into first gear with my right hand, and then drove out of the garage. 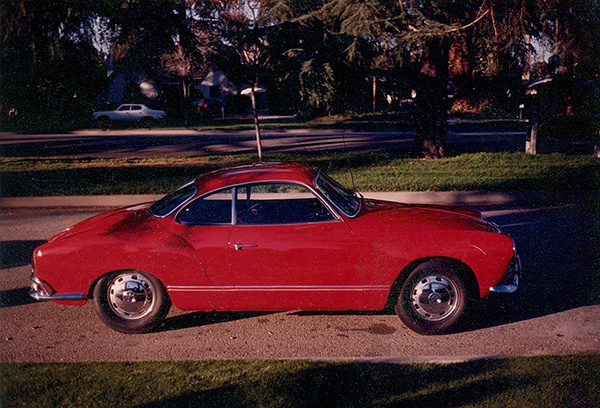 For several years during the mid-1980s I had a Karmann Ghia obsession. 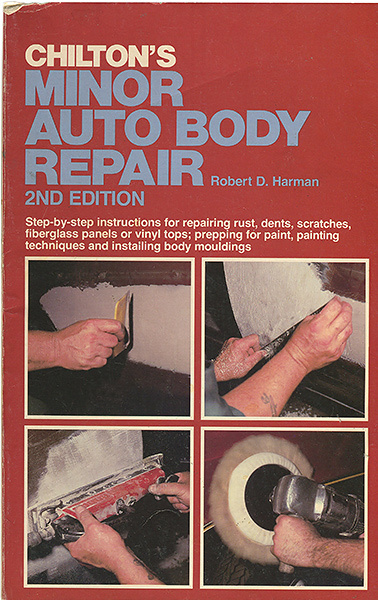 Over Christmas Break 1985, when I was sixteen, I paid $9.95 for the below book about body work. I did the body work on the Marina Blue ‘67 Ghia, and turned it red. The unrestored and then restored Ghia attracted a lot of attention. Like all beautiful things, it was twice hit. The chrome bumpers were not much protection. First, an elderly woman backed into me when I waited to get into the parking lot of the business complex on Riverside Drive and Fulton on my way to the bank. A year later a man who claimed he was just released from prison rear ended me, and further claimed he was too busy admiring the car for the last half mile to brake. An unscrupulous North Hollywood body shop let the car sit near overspray most of the summer of 1988. The vintage ride was never the same. In 1989 she was stolen off the street in front of my parent’s home that faced Chandler Boulevard.